ARSENAL MANAGER ARSENE Wenger has insisted that, unlike Tottenham Hotspur counterpart Mauricio Pochettino, he is refusing to give up on his side’s Premier League title chances just yet. The Gunners suffered a 3-1 defeat to Manchester United at the Emirates on Saturday thanks to a superb performance from goalkeeper David de Gea. The result leaves Arsenal fifth in the table, 15 points behind runaway league leaders Manchester City. And while Tottenham manager Pochettino accepted recently that his side have little chance of lifting the crown , Wenger was unwilling to do likewise. “I am not Pochettino, I am Arsene Wenger,” the Frenchman told reporters. Arsenal had 33 shots against United, but De Gea made an incredible 14 saves to deny Wenger’s team. He admitted it was difficult to accept the result but believes it should make his players even hungrier. “I believe the game, it has to make us angry and even more determined,” he said. “If I am a player, and I think with what we produced, we have a huge potential, and we lose the game, we cannot accept that. 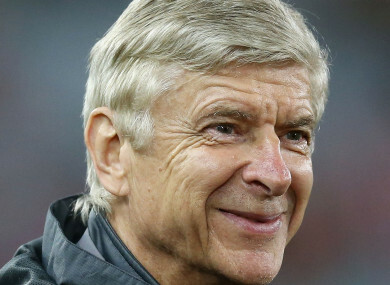 Email “'I'm not Pochettino' – Wenger refuses to give up on Arsenal's title chances”. Feedback on “'I'm not Pochettino' – Wenger refuses to give up on Arsenal's title chances”.